Wielkopolski Indyk was established in 1967 at the initiative of Alfred Glinkowski. Over the years (especially the 80s) the company had been developed by its founder, who gradually introduced his descendants: Włodimierz, Zbigniew, Henryk and Grzegorz to the company’s management. Today the company is known for its high-quality products. 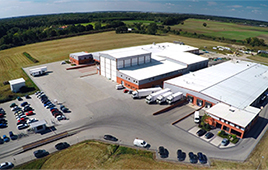 Until the end of April 2004, the production took place in “Dymaczewo Stare”, but after Poland joined the EU there was a need to increase the plant’s efficiency and to ensure the required EU standards on export qualification. This is one of the main reasons the plant was moved to a modern facility in “Bolesławiec” near the National Park. The chosen place was not random. It is very important for the company that the production takes place in a clean environment, far away from bigger cities. At the same time, the owners care for the environment and introduced sustainable practices – own sewage treatment plant and biogas production plant. What is the quality of Wielkopolski Indyk’s products? We set a goal that our products are associated with the highest quality possible. We want, that our brand is recognized in the conscience of our clients as the one brand producing goods containing 100% turkey meat. We supervise the whole poultry breeding from one day turkey and control the production process on every step. Our products are gluten free, and most of them is allergen- and glutamate free. Our quality is confirmed by IFS and BRC norms and Halal. Every detail in our company leads to building up a reputation of a company with rich values in the high-quality poultry production. Throughout the years we gathered a lot of experience on the culture and quality level which makes us a reliable business partner and the “Wielkopolski Indyk”-brand guarantees satisfaction!